ThinkGeek's TK-421 iPhone case features a (working!) 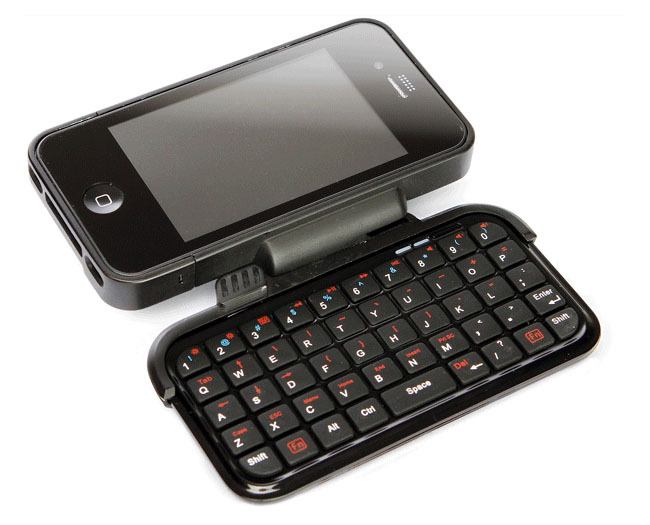 swing-out QWERTY keypad and works with the iPhone 4 or 3GS. Users of BlackBerry devices and several other messaging-centric phones have long derided the Apple iPhone for its virtual on-screen keyboard. Now, ThinkGeek is looking to offer iPhone users some thumb-tastic messaging credibility with its new TK-421 case for the iPhone 4 or iPhone 3GS, which features a (working!) swing-out QWERTY keyboard for users’ messaging needs. The keyboard works with the iPhone as a Bluetooth input device, which means no alterations to the phone are required for the keyboard to work, although use does mean tapping a little extra battery power to keep Bluetooth running. As a standard input device, the keypad should work with any installed iPhone application or service, including email, text messaging, social networking clients, Web browsers, and more. A magnetic clasp holds the keypad open or closed, and the keyboard itself is powered by a rechargeable battery: pop the device onto a USB port to recharge. ThinkGeek is offering separate models for the iPhone 4 and 3GS, owing to the devices’ different sizes. The case is not compatible with the iPhone 3G or original iPhone. The ThinkGeek TK-421 case will be available in late November for $49.99.